Heartbreaking Cards of Staggering Genius: What is going on with this kid from Bill and Ted's Excellent Adventure? What is going on with this kid from Bill and Ted's Excellent Adventure? Yesterday I was reminded that someday there might be a third Bill & Ted's movie and so I dusted off Excellent Adventure and Bogus Journey for a watch. Bill and Ted take their kidnapped historical figures to a classic '80's mall and as Joan of Arc is looking at some weightlifters (which is something you would commonly see in a mall back then, right?) a guy in a baseball jersey walks behind her. As the camera moves it becomes clear that his is wearing a Houston Astros jersey with a "We Are Family"-era Pittsburgh Pirates outfit? What the heck is going on here? Points for wearing the best baseball cap every created but heavy deductions for wearing two different teams at the same time. That's worse than wearing a band's shirt to their concert. Also heavy deductions for tucking in a jersey. Please, don't ever pull a Michael Wilbon. But is it actually a Pirates cap? 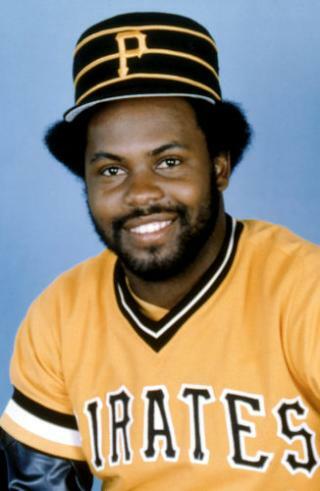 The cap the kid is wearing is missing the large "P" that you can clearly see on Bill Madlock's cap below. I looked around at the Pirate jersey designs and couldn't find one that doesn't feature the "P." So was it a generic ripoff? Was there another company making those honeycomb style hats at the time?